Search Challenge (3/30/16): Body modifications? ... sometimes intentionally, sometimes unintentionally. 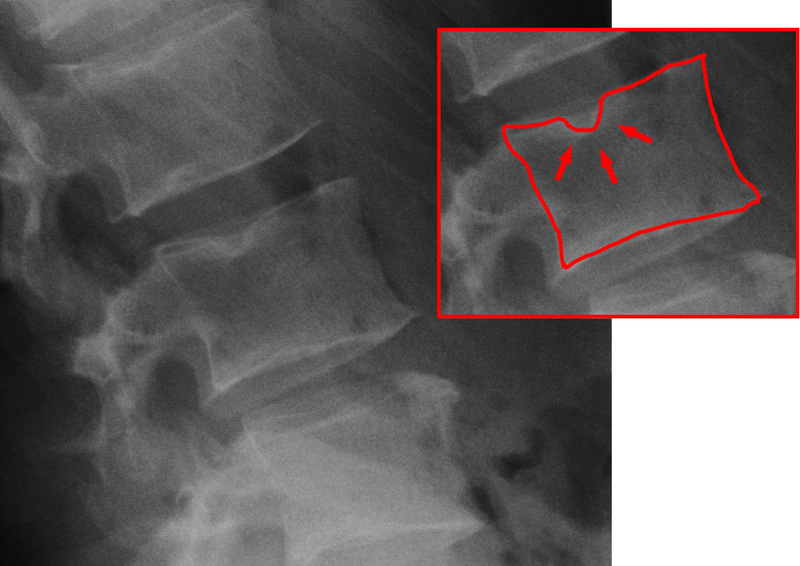 As you probably know, the vertebrae in your backbone can be modified if you carry heavy loads for a long time, and you'll develop Schmorl’s node (a kind of notch in the bone where the nucleus pulposus is pushed into the vertebrae body). And of course, modifying your teeth has been popular for some time. These are pictures of two Zapotec skulls I saw in the museum at Monte Alban, near Oaxaca, Mexico. Whether from work (as in Schmorl's notch), or intentionally for beautification reasons, people have modified themselves in many ways over the years. Tattoos and scarification have been done forever, but modifications involving underlying bones or teeth are much less common, probably because of the possibility of things going badly. As usual, if you know the exact term to describe what you're looking for, the search process becomes MUCH simpler. Seeing these "dental inlays" reminded me that they were common among the Maya, Zapotec, and Aztecs. Of course, knowing the term "dental inlay" makes your search much simpler, and a search for [ Maya dental inlay ] is really interesting. So today's Challenge is to find a few specific terms to help target your searches in today's topic area.... bone & teeth modification! 1. I've heard that people who habitually smoke a pipe have a distinctive pattern of wear on their teeth. Does that particular pattern of wear have a specific name? What is it? 2. Same question, except for people who are habitual sewers (that is, people who make clothes often). Do they have a particular pattern of wear in their teeth? What's that called? 3. Despite the difficult of bone modification, there is one bone that is (was) commonly modified by certain groups of people. What bone is that? How was it usually modified? My answers (and answer paths) on Monday of next week. Answer: What's the unexpected connection between these two? You never know what you'll find when you go for a run (or walk) at different places. In particular, there are often fun and unexpected connections between different places and people. This Challenge is about finding the connections between the two men depicted below. In my clues I said... that these two gentlemen had dinner together once upon a time, while they were sworn enemies at the time. Excuse me? What's up with this? 1. Who are these two gentlemen? 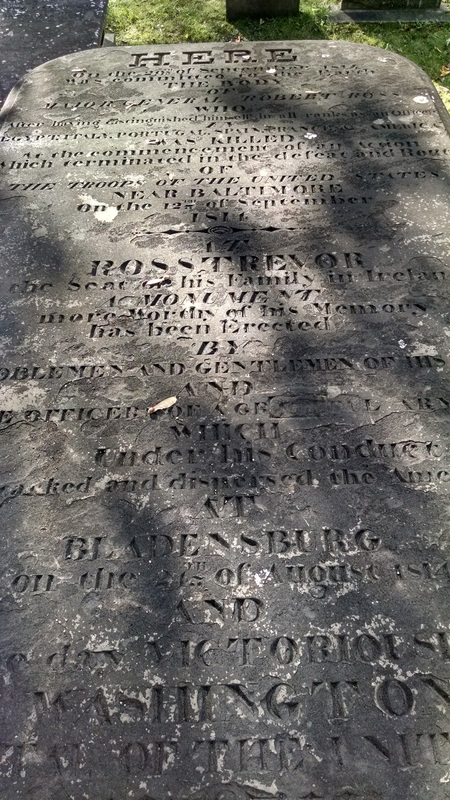 Just zooming in on the gravestone images you can read that this is the gravestone of Major General Robert Ross. "After having distinguished himself in all ranks as an Officer in ..Italy, Portugal, Spain, France & America... was killed during the commencement of an action..."
By looking at the EXIF metadata on the second image, you can pull out the lat/long (where I was standing when I took the picture): 38.904853, -77.068136. 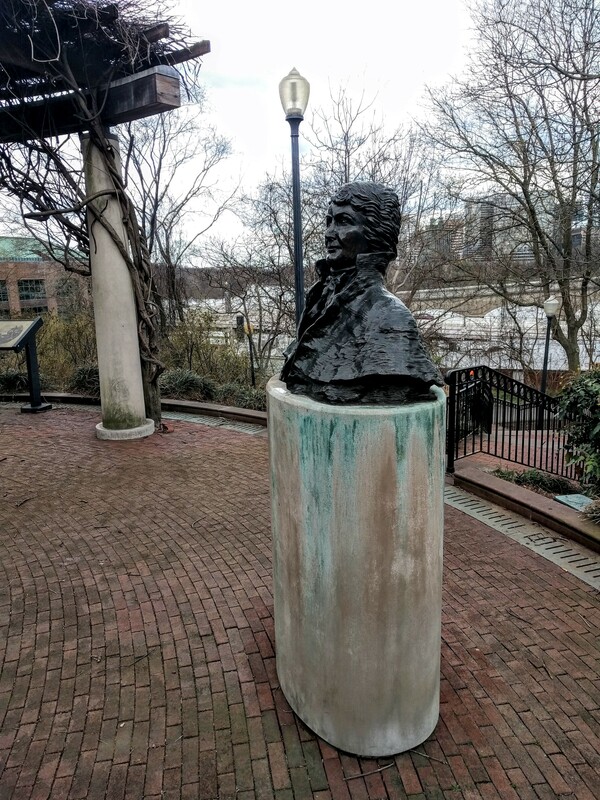 Putting that into Google Maps tells you that I was at Francis Scott Key park in Georgetown, just up the Potomac River from the White House. 2. When / where / why did they have dinner together? ".. 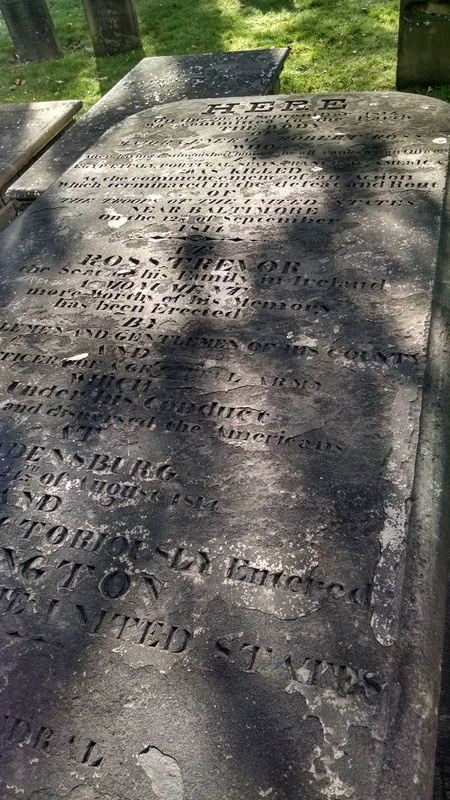 It was aboard the Tonnant that the Americans Colonel John Stuart Skinner and Francis Scott Key dined with Vice Admiral Cochrane, Rear Admiral Sir George Cockburn, and Major General Robert Ross, where they negotiated the release of a prisoner, Dr. William Beanes. After his release, Skinner, Key, and Beanes were allowed to return to their own sloop but were not allowed to return to Baltimore because they had become familiar with the strength and position of the British units and knew of the British intent to attack Baltimore. As a result, Key witnessed the bombarding of Fort McHenry called "The Defense of Fort McHenry," later named "The Star-Bangled Banner." - Searching for the Forgotten War - 1812: United State of America. 3. And why is the night of their dinner such a memorable event? This is a bit tricky. What evening was their dinner? If you read the preceding paragraph, you'd (naturally) assume that these gentlemen had dinner, then Skinner, Key, and Beanes went back to their sloop to watch the bombardment of Fort McHenry. But that would be wrong! you'll find that the battle (that is, the all-day-all-night bombardment from the British ships) happened on September 13-14 starting at 6AM. And I found it: In What So Proudly We Hailed: Francis Scott Key, A Life, by Marc Leepson (and a few others), I found that this fabled dinner took place on September 7th, at the mouth of the Potomac River, which isn't exactly near Fort McHenry. In Leepson's book, "... the three Americans were first escorted to the British frigate Surprize, under the command of Admiral Cochrane's son, Sir Thomas Cochrane. On September 10, Key, Skinner, and Beanes were allowed to return to the President, accompanied by British marine guards. The Surprize towed them into Baltimore Harbor, about eight miles from Fort McHenry, behind the fifty-ship British fleet, where they dropped anchor. They spent the next four days there..."
And in the meantime, Robert Ross led his expeditionary force onshore at North Point, trying to run around the flank of the Americans in Baltimore. 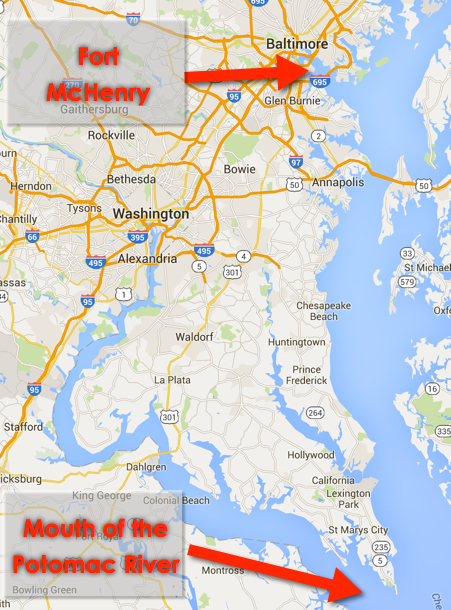 Map of Fort McHenry and the location of the British fleet. Note that Ross was killed well to the east of the Fort on September 12, 1814. So... why was their dinner such a memorable event? Well, it really wasn't... other than that Francis Scott Key and John Stuart Skinner managed to get Dr. Beanes free by negotiation. But in the process of hanging out aboard the British ships, they knew too much, so they couldn't just be sent back to spill the beans (so the speak), but had to be kept on board for 4 more days while the British paid attention to Fort McHenry while trying to take Baltimore. The Brits really wanted to take Baltimore, which they referred to as a "nest of pirates" for the Baltimore Clippers (a kind of fast ship) tendency to raid, size, and sink British ships while on the high seas. But it didn't work out... the dinner lead to a successful prisoner negotiation, and the US has a national anthem as a side-effect. 1. I've said this before, but it constantly bears repeating: READ CAREFULLY! I have to admit that I misread these passages when I was first writing up the Challenge method. I (like several Regular Readers) jumped to the inference that the dinner was the same night as the famous attack. It was only when I was writing up the answer that I noticed that Ross died the day before the bombardment, and Key's writing of the poem. 2. A useful trick to get to a deeper understanding is to write up a mini-essay that presents all of your information. I'm 90% convinced that having to write something down (and have that writeup make sense) is a great method to making sure that all of your ducks are in a row. If you're being honest with yourself, you'll pick up all KINDS of mistakes in your reasoning and data (such as when it seemed that Robert Ross was killed before the date I'd assumed was the day of their dinner!). I'll just repeat my two Search Lessons from above. But more generally, there are lots of historical events that can stand a bit of closer inspection. In particular, looking for the sequence of events over time can be really illustrative. One trick to making compelling lessons is to find something that links to a REALLY important (at least to your students) event. Where ever you're a teacher, look for the local connection. In Albuquerque, for instance, what were the big political issues for Spain (which owned much of the American southwest) in the year the city was founded (1706)? What connections can be made between the political situation in Spain and in New Mexico at the time? History is fascinating, but it's also worth close study because it's easy to jump to an inadequately supported conclusion! Search Challenge (3/23/16): What's the unexpected connection between these two? I love finding the unexpected connections that link things together. I loved that book Connections by James Burke (still highly recommended, both as a book and for the videos), and the ways in which connections can be found between animals, plants, ecosystems, and people. We've talked about these kinds of discovered connections before (example: about a femme fatale and an executive chef), so you know how I feel. I really enjoy finding these unexpected discoveries about people. So you can imagine my delight when I accidentally discovered the connection between the two people depicted in the images below. The pictures themselves were wonderful moments when I literally ran across these sites at two very disparate locations (yes, I took these images while running through these two locations on different dates). It turns out that these two gentlemen had dinner together once upon a time. But the remarkable thing is that they were sworn enemies at the time. I certainly had no idea that they'd dined together, let alone on date that would go down in history. What was it about that one evening that left such an impression? Let us know how you figured it out! Be sure to click on the images to get the full resolution versions. ... but for SearchResearch, the primary reason is that they often have the latest and greatest content on any given topic. Let's answer this week's Challenges, and then talk about why this is an important research skill to have. 1. Conferences typically have papers that are classified as "Best Paper." What was the title of the Best Paper for this year's Conference on Human Information Interaction and Retrieval? First, what's that conference anyway? leads quickly to the conference website: sigir.org/chiir2016/ Looking at the home page you'll find this is first meeting of this conference (which is, interestingly enough, all about SearchResearch-type topics). But if you look at the URL, you'll see it's hosted by SIGIR, and if you look at their page, you'll find that's a professional group dedicated to the topic of Information Retrieval. This is a common thing to do; have a professional organization host a specialty-topic conference (like CHIIR). it won't return anything about the best paper of 2016, only who was on the committee to identify it). Going back to the CHIIR website, you'll find that their paper is called Playing Your Cards Right: The Effect of Entity Cards on Search Behaviour and Workload by Bota, Zhou, and Jose. 2. Who was opening keynote speaker at CHIIR 2010? (No, I'm not crazy--I'm asking this for a specific reason that I'll reveal on Monday.) BTW, why is this special talk called a "keynote" anyway? As we noticed earlier, this is the FIRST year of CHIIR, so what's up with asking about 2010? 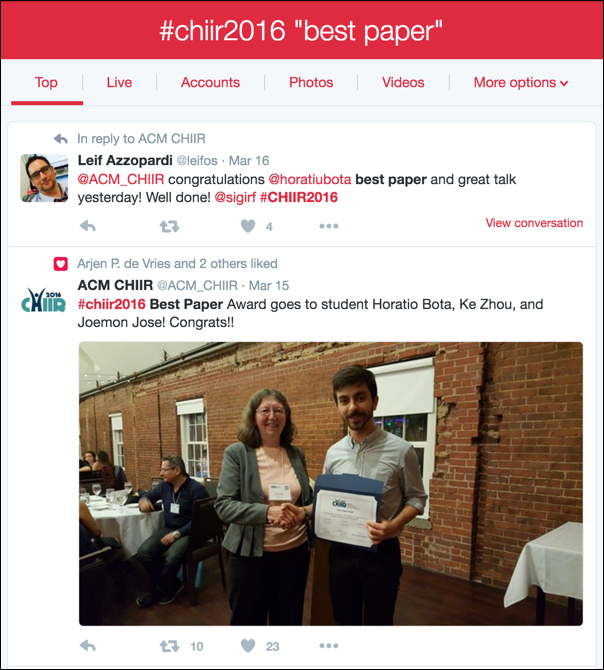 If you look at the home page, you'll learn that the CHIIR conference is a merger of two earlier conferences, Information Interaction in Context conference (IIiX) and the Human Computer Information Retrieval symposium (HCIR), which have run since 2006 and 2007 respectively. If you look up the definition of "Keynote" on the Online Etymology Dictionary you'll find: "also key-note, "lowest note of a musical scale, basis of a tonal key, the tonic," 1776, from key (n.1) in sense of "musical scale" + note (n.). The keynote is the given note on which the melodic and harmonic relationships in the scale are built, and it gives its name to the key. However, the original use of keynote in the figurative sense of "leading idea, central principle" is from 1783; keynote address is 1908, American English. Well, if you look more deeply, not really 1908, in fact. The Merriam-Webster gives 1914, the Random House (at Dictionary.com) gives 1905-10. But if you look for [ keynote speech,keynote address ] at Google Ngram Viewer, you'll find references from the 19th century. 1. George Francis Dawson, Life and Services of Gen. John A. Logan: As Soldier and Statesman, 1887, transcribing on p.136 "Logan's 'keynote' speech in the House, 1868—Scathing review of the 'Principles of the Democratic Party'." 2. David Decamp Thompson, Abraham Lincoln: The First American, 1895, mentioning on pp.45- "Lincoln's 'keynote' speech." Notice how on both these sources "keynote" comes in quotation marks, implying that it was at the time a recent use of the word. Notice also that Wikipedia is incorrect on their statement "The term key note comes from the practice of a cappella, often barbershop singers, playing a note before singing." The term precedes barbershop singing by several centuries. The link provided as a reference, though, doesn't make this mistake, while explaining very well what a keynote speech is or should be: "I like to think of it as similar to the key note for a cappella singing – its sets the overall tone and context for the event." 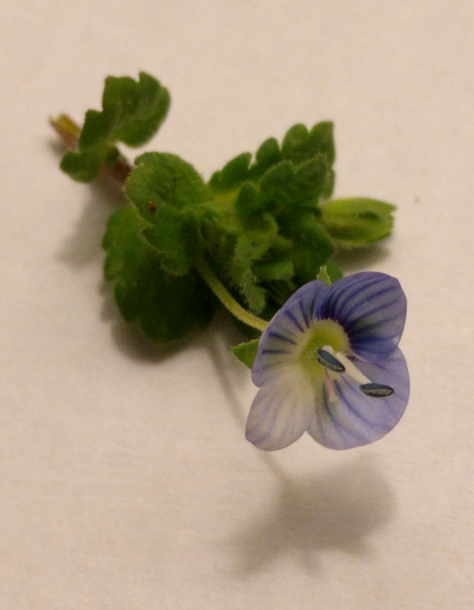 Another solution was to search for a wildflower identification site, as Regular Reader Casey Brough did, finding wildflowersearch.com, then entering the lat/long for Chapel Hill, NC (35.916088, -79.054398) and filtering on blue (or purple) and scanning down the list to find that this is Veronica persica (aka Persian Speedwell). Note the distinctive one petal that's smaller than the other three. 4. What is the largest scientific conference that's held somewhere in the world each year (annually)? Why did I add in "attendees"? Because I wanted to find pages that gave the estimated crowd size, and every page I've ever seen always says "... with nn,nnn attendees... yourConferenceHere is the largest conference in the world... "
You have to be a little careful with this because we're talking about bragging rights here--every conference wants to be the biggest, the best, or the most-talked-about. So you'll see slightly weasley text like "...yourConferenceHere is the largest society in yourTopicHere in the world, and our conference..."
That's probably technically correct (that is, their society is the biggest), but that's NOT the same as the conference size, which can be very different. Of course, those are all academic or scientific conferences. So, the bigger question for this week is really "how do you find conferences on a given topic?" and find a bunch on that topic. Some of them might be more practitioner-oriented than academic, so if you want the latest research in that topic area, try adding "papers" as a context term (because academic conferences want participants to present papers, which will be the latest in research results). 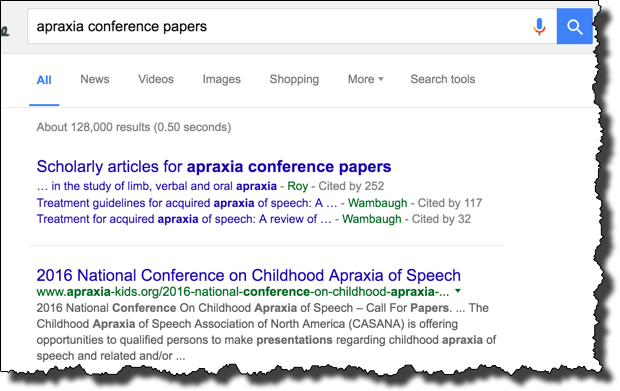 As you can see, there are a set of papers found in Google Scholar that would be worth looking at, not just for the article content, but also for the citations, which will tell you the names of the journals and conferences where they're published! 1. 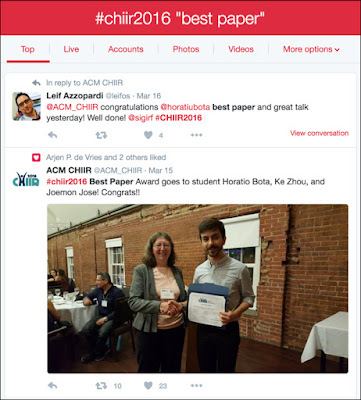 Search Twitter when you need late-breaking conference information... especially if that information (like "best paper awards") might not make it onto the conference website. 2. Remember that conferences will sometimes change names, merge with other conferences, or split into separate conferences. Usually the conference web page will disclose that information (but not always.. you might have to hunt around for the transition--checking Google Scholar can help here). 3. Check out the file name! As Hans found out, sometimes that's a bit of metadata that's just exactly what you need. 4. There are specialized tools to help find flowers (and bugs, and animals, and...). You can usually find these by searching for the kind of thing you want to identify, and then identification. 5. When looking for something that's the biggest / tallest / best... be sure to look for multiple opinions on that. For superlative properties (like the biggest conference), people will push their opinion... so be careful not to take the first one you find. I think that teaching your students about the existence of professional academic conferences is a great idea, but then, that's where I primarily publish. BUT... it can open up your students to a rich, new kind of content that they might not know about. (I'm willing to bet that most students don't know what an academic conference is like, let alone that there might be one in a topic that they're interested in! For background on academic conferences, see the Wikipedia entry that gives a short overview. in early spring, pollen starts to show up in the gutters. In between the bursts of rain, early flowering trees—where I live it’s the plums, almonds, and acacia—all start producing pollen in abundance. It all washes down from the stamens, over petals and into the drains, leaving long strands of cadmium yellow along the rainwater’s edge. Fecundity’s promise, denied and discarded, but leaving brilliant streaky color along the way to sea. In the San Francisco Bay area, those rains visit only between November and March, just five months of the year. Maybe because they’re so rare, they seem to bring wonderful moments of pure delight. As I walked down the street just after a long rain, the sun emerged for a moment drenching the wet surfaces in warmth and light; a momentary pause in the rain that filled with brilliant sunlight. I turned around, looking away from the sun, hoping to catch a rainbow in the droplets reflections, but missed seeing anything. I kept walking. As I passed a tall pine tree, one drop fell off the tree limb into the sunlight, an aerial jewel. Then another, and another… until an entire shimmering cascade came off the long needles and into the shaft of light with a hush of quiet velvet sound. No rainbows in the moment, but there’s a curtain of falling crystals to see. It was just an avalanche of raindrops; it happens constantly, nothing special in particular. But in that moment, in that quintessence of a fragment of time, I missed the rainbow, but saw diamonds in mid-flight, surging to the ground. 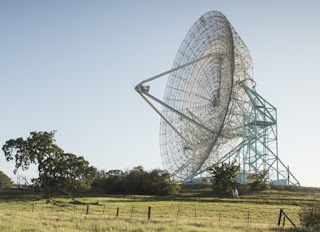 Earlier that morning I’d gone for a run at the Stanford Dish, it’s an open area featuring a gigantic radio-telescope, a landmark in Silicon Valley. But for locals, this is one of those standard runs you do often, just because you know exactly how far it is, what the trail is and what to expect. It’s not an exploration so much as it is a familiar ritual. In rainy weather, though, it can be surprising. The Dish is in a hilly region of Palo Alto, with spectacular, open views in all directions. When it’s clear, you can see from San Francisco to San Jose (thirty miles to the north, thirty miles to the south) up and down the bay. To the west, the Santa Cruz mountains form a woodsy barrier wall. And when it rains, the clouds seem to always be especially dramatic from this hilltop. Naturally, being a curious guy, I was thinking about that as I ran on the crestline trail. It’s where the views are best, and where the view of rain, clouds and sky are always most impressive. Why is it so consistently impressive? Is it just the openness of the viewshed? On this run, this time, I noticed two patches of rain off in the distance. One was to the north, roughly over San Mateo, where there’s a gap in the western coastal mountains that lets the fog through in the summertime. The other rainy patch was to the south, roughly over Los Gatos, where there’s another gap in the mountains. An insight begins to dawn… Those two patches of rain are coming from the sea to the west, and are coming through the gaps in the mountains. Of course! The reason the clouds are always so spectacular is that the Dish happens to sit between two major mixing points between the marine layer of air (coming through the gaps) and the air that sits in the bay (or in the summertime, that’s coming from the east, off the Central Valley). In essence, this is the eddy between the mixers. Swirls, bumps, and lumps in the clouds happen preferentially here. Shafts of light that come through the breaks happen here as well, for just that reason—it’s an accident of geology. The San Mateo gap is well-known. It’s what lets the summer fog over the mountains, often causing SFO to shut down. The gap at Los Gatos is also well-known—it’s where Highway 17 takes the low pass over the mountains to reach Santa Cruz. When I get home I do the obvious thing and search for a rainfall density map of the Bay area, looking for confirmation that my gap theory is actually true. And after searching for a while (the key insight was to realize I needed a “precipitation” map, not a “rainfall” map), I found just the diagram I sought. And it’s true. Extending eastward from both mountain gaps are regions of increased rainfall. Los Gatos averages about 33% higher rainfall than the Dish, with similar numbers for San Mateo. Even better, the map shows a plume-like structure to the rain distribution: it’s the gaps causing the focusing of precipitation. And now, naturally, being a curious guy, I wonder if there is a difference in the types of pollen you’d find in the gutters and waterways of Los Altos (to the south) and San Mateo (in the north) as compared to the location of the Dish. I suspect so. That search continues. I will tell you that in the process of searching for differential pollen patterns in the Bay area, I learned a new word: palynology—the study of pollen… and its distribution. The word dates from 1944, and was coined in the Pollen Analysis Circular (a small journal that published from 1943 to 1954 and then merged with the larger publication, Micropaleontologist). The question is, can I link geological features to pollenfall patterns? What kind of research would I have to do to get the answer? That’s the joy of finding stuff out—the chance to look at the world, do a bit of deep looking and digging in the literature, pulling together ideas, linking them together to learn something brand new. I love doing research both professionally and at a small, personal scale. And I now know why running the Dish on a rainy day is almost always rewarding—it’s fertile ground for observing the world and launching into small personal research quests. The next step is just connecting literatures between geography, meteorology, and palynology—a cross pollenization of academic disciplines, if you will. Answer: Where is everybody moving to? Are we making personal search WORSE?